This article is for the limited 5★ Okita Souji. 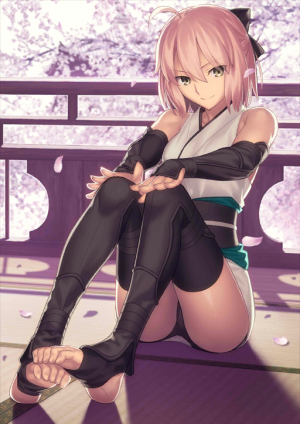 For the limited 5★ , see Okita Souji (Alter). Available during the GUDAGUDA Honnoji event. 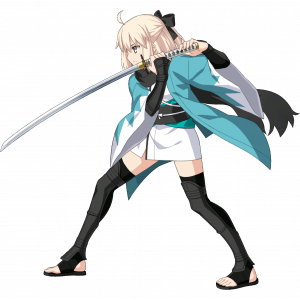 Okita Souji, First Unit Captain of the police force that was active during the end of the shogunate, the Shinsengumi. 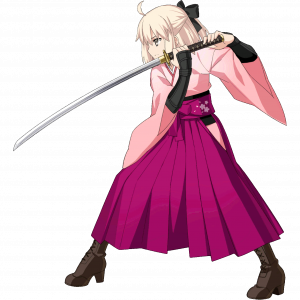 Of all the talented swordsmen in the group, Okita was revered as the strongest and the most skilled. "No, I don't fire beams." A pretty girl in her late teens, clad in a colorful kimono. Her uniform sticks out too much, so she usually wears this to hide her true identity. She is both a cold-blooded killer and a kindhearted person who loves children. 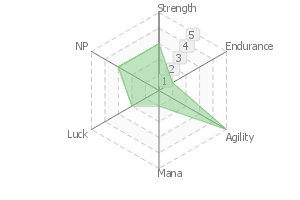 Captures a maximum of 1 target. An ultimate technique used by the prodigy, Okita Souji. Consists of the "First Thrust," the "Second Thrust," and the "Third Thrust." The three thrusts are not almost simultaneous, but completely simultaneous. A secret technique only usable by the truly skilled and agile. The instant the technique is unleashed, all three thrusts exist in the same place and at the same time. Even if the opponent can block the First Thrust, the Second Thrust and the Third Thrust will pierce through the defense. And for this paradox, an Event Saturation Phenomenon will occur at the tip of the sword, making this technique quite literally unblockable. Through proper application of the Event Saturation Phenomenon, this attack is good at destroying matters as well. 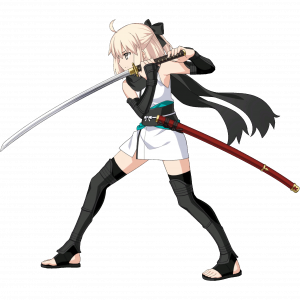 While she possesses enough raw talent and unparalleled skill to be called a prodigy swordsman, her Stamina and Magic Resistance are unusually low for a Saber Class. This is because on top of her illness when she was alive, her existence was overwritten by the image people had of her after her death. In a way, this is a curse similar to that of "Innocent Monster." Her wish upon the Grail is "to fight until the end." This was her dearest wish, and one she ended her life unable to fulfill. 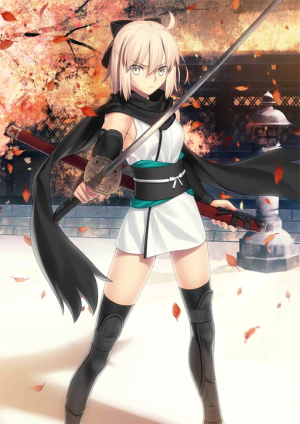 Even now as a Heroic Spirit, she regrets being unable to fight with her former comrades, and is convinced that she's a failure as a member of the Shinsengumi. Okita Sōji was the captain of the first unit of the Shinsengumi, a special police force in Kyoto during the late shogunate period. He was an elite swordsman and adept at utilizing concealed weaponry. 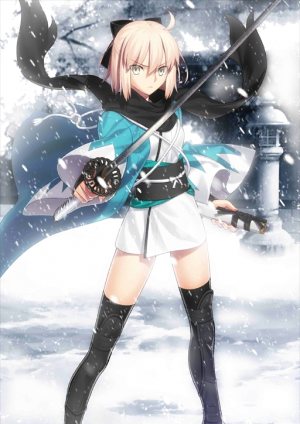 A genuine genius swordsman who possesses both transcendental finesse and innate talent, but as a member of the Saber Class, her low Endurance and Magic Resistance stand out. In addition to her illness from while alive, this is also a result of being heavily painted over by the impressions held by the later masses; in a sense, she is under the influence of a curse very similar to Seraphic Monstrosity. Her wish to the Holy Grail is "to fight to the bitter end". Her dearest wish from while alive, which ended not being achieved no matter how much she wanted to. 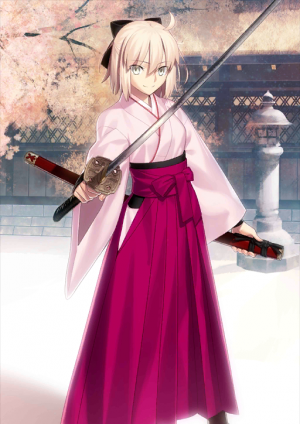 Even now, after having turned into a Heroic Spirit, she is regretting not having fought together with her comrades and has a wrong impression of herself as a failure of Shinsengumi's soldier. 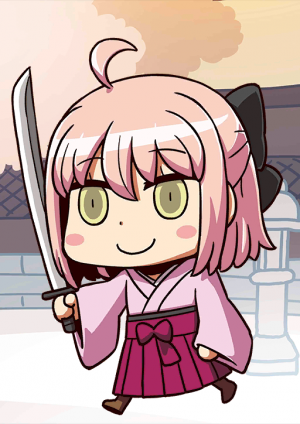 The sure-kill demonic sword of Okita Souji, a rare genius swordsman. Within the "first thrust", a "second thrust" and "third thrust" are contained. Not "almost simultaneously", but horizontal thrusts that are released "exactly at the same time" from the hiraseigan-no-kamae; a secret sword technique produced by transcendental finesse and speed. In the moment of the Sandanzuki, the first thrust, second thrust and third thrust exist "at the same place" and "at the same time". Even if the first thrust is defended against, due the contradiction of second thrust and third thrust that exist at the same place piercing through, the sword's point causes a localized phenomena saturation. Hence, the Sandanzuki becomes a sword that, in practice, cannot be defended against. Rather than calling it an application, it also excels object destruction by making use of the resultant phenomena saturation.